Martin McGuinness yesterday appeared frail and sounded audibly unwell as he spoke to journalists to announce his resignation. The veteran republican – who has not been widely seen in public over the last month – denied that his health problems, for which he is undergoing intensive treatment, had influenced his decision. But the senior politician’s appearance – as a result of an unspecified medical condition – created shock among journalists who have not seen Mr McGuinness for several weeks, and members of the public on social media. On BBC Radio Ulster’s Evening Extra programme last night, Sinn Fein MLA Conor Murphy said that Mr McGuinness would remain Sinn Fein’s leader at Stormont, though he added that his party colleague required further treatment. Earlier yesterday, veteran Sinn Fein MLA Alex Maskey sounded less certain. When asked on whether Mr McGuinness was about to stand down, he told the Nolan Show that the then deputy first minister “will decide what he’s going go do”. Last night SDLP leader Colum Eastwood appealed for rival politicians and journalists to give Mr McGuinness space to deal with his health problems. 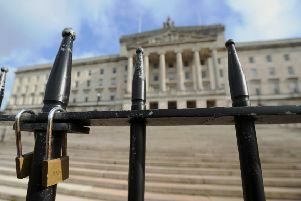 The Foyle MLA said: “Today has been a day of fierce political debate and argument, that’s understandable. However, one thing that shouldn’t happen in this discussion is people using Martin McGuinness’s health as part of a political tactic. “Politicians and journalists alike should allow Martin McGuinness the time and space to deal with and recover from his health issues. It was Gerry Adams who first made public, just over a month ago, that his colleague was ill. And it was Mr Adams who again raised the issue a fortnight ago, stating that Mr McGuinness’s health issues were having a political impact on working with the DUP. The then deputy first minister was asked directly about his health in an interview with the BBC’s Mark Devenport and declined to provide any details, other than to say he was being treated by a “wonderful group of doctors”.